Doctor Who has been on and off the air for nearly 54 years, and part of the key to the show’s longevity is that the baton of its lead character can be passed from actor to actor, from the First Doctor, William Hartnell, all the way to the upcoming 13th Doctor, Jodie Whittaker. But Doctor Who goes far beyond recasting—changing the lead character is a fundamental part of the show itself. Recasting a lead actor to continue a popular character is not a unique concept—just look at James Bond. But in 1966, Doctor Who’s creative team built the change directly into the fabric of the show itself, a power that allows the character to escape death by completely transforming their body, both in physical form (including gender, as we know now) and in terms of personality. In doing so, Doctor Who has created a strange new legacy for itself over the 51 years since William Hartnell’s final story, “The Tenth Planet,” aired. But the casting of Doctor Who’s next star has its own story, too. 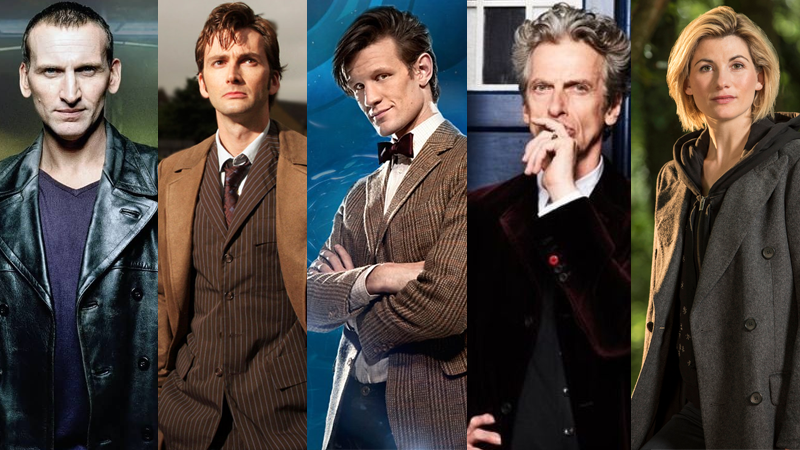 Over the years the announcement of who would play the next incarnation of the Doctor has evolved into a growing pageantry, especially after the show’s return to screens in 2005. Here’s the weird, complicated history of how Doctor Who has announced the new leads over the years, from its tragic origins to the global event it’s become today. In 1966, the producers of Doctor Who found themselves in a troubling situation. While the show itself was hitting new heights in popularity, its lead actor, William Hartnell, was suffering from a variety of health problems, which led to clashes with the production staff. This led producer John Wiles to plan a radical move for the series: replace the ailing Hartnell with a new actor. Initially, there was going to be little explanation for the change. Wiles planned to have a new Doctor appear during “The Celestial Toymaker,” a story which opened with the Doctor being turned invisible by the titular being. When the Doctor returned to tangibility, Wiles wanted him to return with an entirely new actor, too, as if the Doctor had been altered in his absence. The BBC vetoed the idea—and Wiles left while the story’s production was in process—but Hartnell’s deterioration meant his replacement was still inevitable. Just months later, Hartnell reached an amicable agreement with new producer Innes Lloyd to exit the show, and Doctor Who’s script editor Gerry Davis decided to write Hartnell’s exit into the fiction of the series. He used the Doctor’s alien race, the Time Lords, to explain that he could continually change himself into a younger man when his body was dying out, a process originally dubbed as a “Renewal.” Patrick Troughton was picked to replace Hartnell, and the fateful changeover occurred in October 1966 during “The Tenth Planet.” The sequence, originally modeled after the effects of an LSD trip, saw an ailing First Doctor collapse on the floor of the TARDIS, his face hazily transforming into that of a new, younger man. Doctor Who’s survival was ensured, not just for the immediate future, but for decades to come. Going into the 1970s, Doctor Who faced more issues behind the scenes, after Troughton expressed his desire to leave the show. That, plus spiraling set costs for the show’s constantly-changing locations, led to the decision to set the next season of the show entirely on Earth, giving the new Doctor a regular supporting cast in the form of paramilitary organization UNIT, and a new mission to defend the Earth from regular alien occurrences. Script editor Derrick Sherwin, acting as co-producer on the show, eventually chose Jon Pertwee to replace Troughton—hoping the actor, known for his comic performances, would continue to develop the bumbling jokester persona Troughton had brought to the role. Naturally, as nothing rarely goes as planned on Doctor Who, Pertwee went the exact opposite direction, wanting to cement himself as a more serious action hero. After Pertwee’s exit from the show, producers initially were looking for an older, more Hartnell-esque actor to replace him. Instead, they settled on Tom Baker, then the youngest actor to play the role. Baker’s introduction would largely cement the canon of “Regeneration” in Doctor Who, a term which was used for the first time to describe the process in Baker’s first appearance in “Planet of the Spiders,” along with the revelation that it was a biological process inherent to Time Lords (although Troughton’s Doctor had described it as something performed by the TARDIS). During Baker’s first appearance, the Fourth Doctor also established that the now-traditional period of erratic behavior post-regeneration was a common side effect of the Doctor’s renewal—facts that pretty much still exist in the show as we know it today. Baker’s departure, after serving a record-holding seven seasons as the Doctor, is really the first time that a Doctor’s departure caused a major media stir for the show—something new producer Jonathan Nathan-Turner, hungry for attention while the show suffered ailing ratings at the turn of the ‘80s, was more than happy to stoke. It wasn’t all because of Baker’s exit, though; some of it was because of an argument we in 2017 are all too familiar with, after the actor cheekily told press that a woman could be the one to replace him. Nathan-Turner had no plans to actually cast a woman—Peter Davison had been chosen pretty quickly, although he was not the first choice—but the producer let the story run rampant in the hope it would drum up new interest in the show. Davison’s replacement, Colin Baker, marked the first time a Doctor who had previously appeared in the show (Colin had played Time Lord Commander Maxil in the 1983 story “Arc of Infinity”) returned for the lead role, something that would be repeated with Peter Capaldi’s casting in 2014. But while Baker’s arrival on Doctor Who was amicable, his exit was anything but. When Doctor Who was put on hiatus in 1989, McCoy’s stint as the Time Lord came to a bizarrely muted end. The series ended as the Doctor and current companion Ace wandered off into the sunset, contemplating adventures fans would never get to see. Work had already begun on a 27th season of Doctor Who when it was suspended, but the series’ cancelation meant that there were no real plans to replace McCoy’s Doctor as the “final” incarnation of the timeline. The mid-‘90s saw several attempts to resurrect the show, including a proposed American reboot pitched by Universal TV. That eventually laid the groundwork for a standalone TV movie in 1996, which was intended to act as a backdoor pilot of a complete Doctor Who relaunch for American audiences. During script work by incoming writer Matthew Jacobs, however, it was decided to scrap the idea of a complete overhaul of Doctor Who’s continuity and instead frame the movie as a continuation of the TV show, which meant bringing Sylvester McCoy back for a brief return so he could “regenerate” into the Doctor’s next incarnation. Paul McGann was the production’s first and only choice for the role of the Eighth Doctor, despite initial hesitation from both Fox, which co-produced the movie, and McGann himself, who was unsure if he could commit to the possibility of a TV series after the movie. They needn’t have worried; the TV movie—simply titled Doctor Who—flopped in America, despite solid ratings in the UK, and future Who plans were scrapped. McGann remained an official Doctor, but the series was doomed to lie dormant for nearly a decade. Doctor Who’s return to TV after years away was announced without a cast in place. While the British press went on to speculate all sorts of weird potential Doctors for the new series (names like comedians Eddie Izzard and Ken Dodd were bandied about), the BBC intended to root Doctor Who in a modern and self-serious tone, and unveiled Christopher Eccleston—then best known for his role as Jesus Christ in The Second Coming—as the new Doctor in 2004. Russell T Davies, the show’s new executive producer, later confirmed that Eccleston’s Doctor would officially be the Ninth incarnation of the character, retconning a previous incarnation played by Richard E. Grant for a web animation series called Scream of the Shalka, released to mark the show’s 40th anniversary in 2003. The initial casting for the show’s return was pretty standard, but Eccleston’s exit was much more controversial. The actor’s departure from the show came just days after Doctor Who’s triumphant return in 2005, thanks to newspaper leaks that led to the BBC rushing out a statement to confirm the actor’s exit. Even that was a disaster, given that the BBC then got in trouble for fabricating comments from Eccleston to use in its statement, which claimed he left the show to avoid being typecast, leading to the BBC apologizing again. None of that even speaks to the fan reaction to the news—which was surprisingly livid, considering Doctor Who had a long history of recasting the Doctor at that point. Alarmed to have lost the Ninth Doctor mere episodes into his run, fans took to the internet to share their fury, which became so heated, popular Who forum Outpost Gallifrey (now shut down and rebuilt by former moderators as Gallifrey Base, and often seen by British media as the best gauge of fan opinion) shuttered for several days to avoid toxicity from developing any further. Less than a month after Doctor Who returned to screens, David Tennant was announced as the Tenth Doctor, news which was unveiled in as simple a manner as his predecessor: a press release. No fabricated statements were needed. Although Davies had brought Doctor Who back in 2005, the act of casting a new Time Lord only truly evolved into a grand spectacle under the auspices of now-departing showrunner Steven Moffat. After Tennant, gone were the days when a simple press release or a newspaper article sufficed to announce a new Doctor Who lead. Suddenly, casting announcements turned into major events, requiring ever-increasing amounts of secrecy and pageantry. Thankfully, our latest casting change was a bit more subdued. Like Smith and Capaldi’s debuts before her, the announcement that Jodie Whittaker would be the next Doctor was a TV event, but instead of the BBC making a live announcement and trotting out the new Doctor to a screaming crowd, Whittaker made her debut as the Doctor in a short clip set within the show itself. It unveiled the first woman to officially play the character in the show’s history, and was aired after the BBC’s coverage of the Men’s Wimbledon final, as well as released online for international audiences. In a way, it’s appropriate that one of the most groundbreaking casting announcements for Doctor Who since the first decision to recast the lead role was made all the way back in 1966 is so unique to all the others which came before it. Here’s to a future full of many more Doctors and their accompanying reveals—may they both be equally varied.